This grave is near those of two Masters of Balliol, Benjamin Jowett and Edward Caird. Although the college was in the parish of St Mary Magdalen, all three burials are in the St Michael section of the cemetery and recorded in its parish register. It appears that the college may have purchased plots near the front of the cemetery from the parish of St Michael, whose population was dwindling. The latest restoration of Professor T.H. Green’s grave in 2014/15 was made possible by donations from the following individuals: David Boucher, James Connelly, Maria Dimova-Cookson, Margit Hurup Nielsen Grove, Medhat Khattar, Helen Loader, Peter Nicholson, James Pearce, Alice Prochaska, Avital Simhony, Peter Strong, Adam Swinbank, and Colin Tyler. The photograph below shows the grave in 2013. 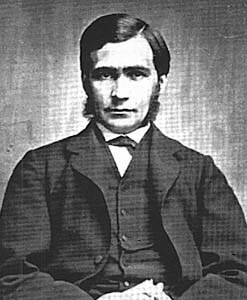 Thomas Hill Green (born on 7 April 1836 at Birkin, near Ferrybridge, West Yorkshire and baptised at Birkin on 15 May). Thomas’s mother died when he was just one year old. His father Valentine Green was Rector of Birkin, and at the time of the 1841 census he was living at the Rectory House there with Valentine (9), Emily (7), Elizabeth (6), and Thomas (5), and four female servants. His father married his second wife, Sophia Lilly, in the Clifton district in the first quarter of 1850. Thomas was educated at home until he was fourteen, and then entered Rugby School. He was boarding there at the time of the 1851 census. Meanwhile his father was still in Birkin with his second wife, and Thomas’s three siblings Valentine (19, a student at Oxford), Emily (17), and Elizabeth Anne (16), as well as a new baby from the second marriage, Margaret Sophia. The family had five servants (a governess, lady’s maid, cook, housemaid, nurse, and groom). Thomas’s father was still Rector of Birkin in 1861, and had two more children with his second wife: Catherine Georgiana, Arthur Valentine. 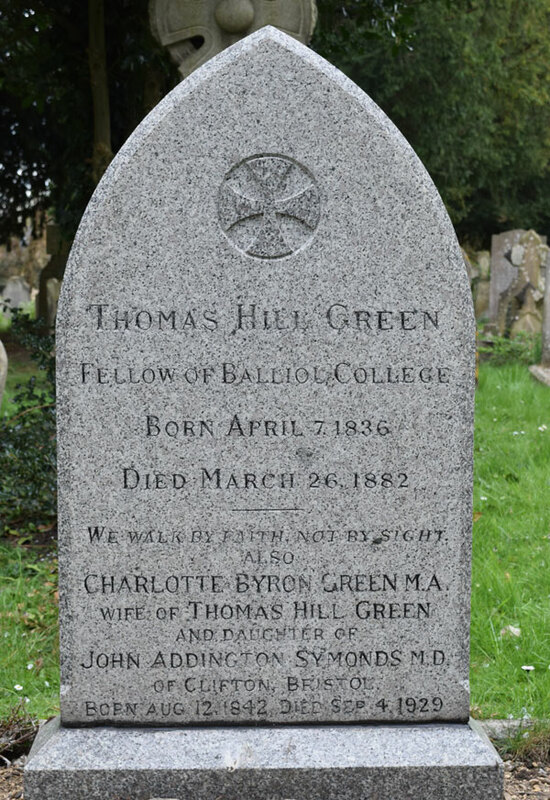 Thomas Hill Green was matriculated at the University of Oxford from Balliol College on 30 May 1862, aged 19. He obtained his B.A. in 1859 and was elected a Fellow of the College in 1860. At the time of the 1861 census he was lodging at 15 Broad Street (now the Oxford Information Centre). From 1869 he lived at Balliol Hall, 26 St Giles' Street (one of the houses demolished to make way for the Mathematical Institute). Charlotte Byron Symonds was born in Bristol on 12 August 1842, the youngest daughter of the physician John Addington Symonds senior (born in Oxford on 10 April 1807) and Harriet Sykes (born in Somerset in 1808/9). Her father and her brother John Addington Symonds junior also have entries in the Oxford Dictionary of National Biography; and her uncle, the surgeon Frederick Symonds, is also buried at St Sepulchre’s Cemetery. Charlotte’s parents were married at Clifton in 1834, and at the time of the 1841 census they were living at Berkeley Square, Bristol with their first three children Edith (6), Mary (4), and John Addington Symonds junior (eight months). Charlotte was born the following year. In 1844 when she was only two, her mother died of scarlet fever. At the time of the 1851 census Charlotte’s father was living at 7 Berkeley Square, Bristol with his children Edith (15), Mary (13), John (10), and Charlotte herself (8), and his sister-in-law Miss Mary Ann Sykes, plus five servants. In 1861 her father was living at Clifton Hill Lane, Bristol, and John (20) and Charlotte (18) were still living at home with Miss Mary Sykes. The establishment was much grander: they now had seven servants, including a butler and footman. Charlotte’s father died at Clifton on 25 February 1871. On 1 July 1871 at Clifton, Bristol, Thomas Hill Green (who had been the friend and then philosophy tutor of her brother John) married Charlotte Byron Symonds. They had no children. On 28 September 1872 Richard Spiers recorded in his diary that the Greens went to view the house he was leaving at 14 St Giles Street. They decided to take it, selecting the furniture they wanted to keep on 10 October and receiving the keys on 30 November. They moved in at the end of 1872 or beginning of 1873, and were still there in 1880. In 1876 Green was elected the first University member of Oxford City Council, to help found and establish the City of Oxford High School for Boys in George Street. The school was opened in 1881, and an inscription to Green (right) was added in the late 1960s. In 1878 Green was elected Whyte’s Professor of Moral Philosophy, and around this time moved into 14 St Giles’s Street. At the time of the 1881 census Thomas and Charlotte Green were visiting Charles Cave and his family at Stoneleigh House in Clifton. † Thomas Hill Green died at 34/35 Beaumont Street on 26 March 1882 at the age of 46 and was buried in St Sepulchre’s Cemetery on 29 March (burial recorded in the parish register of St Michael’s Church). 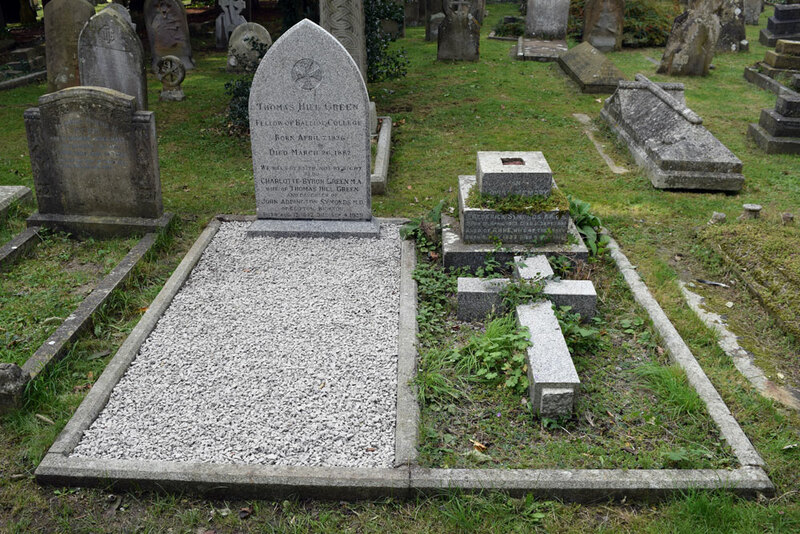 He was buried in double plot with continuous kerbs where his wife's uncle, the surgeon Frederick Symonds (brother of John Addington Symonds) had been buried the previous year. Normally the burial would have taken place in the St Giles's section of the cemetery, but the dwindling parish of St Michael appears to have been recycling prominent plots near the entrance to the cemetery in this period. The funeral took place on Wednesday afternoon, the first portion of the service being read in the Chapel of Balliol by the Master of the College, the body having been removed thither from the house of Mr H. P. Symonds on the previous evening. The coffin was placed on a bier in the centre of the Chapel, and was covered with a pall, on which were deposited several wreaths and crosses of choice flowers. By three o’clock the Chapel was filled in every part with the relatives, members of the University, the Corporation (the Mayor’s Sergeant carrying the mace covered with crape), the School Board, and many others. At the conclusion of the service in the Chapel, a procession was formed, but the pre-arranged order of it was somewhat modified. The rain fell in torrents, drenching many of those present, and probably not a few were compelled to abandon their intention of walking to St. Sepulchre’s Cemetery. At the head of the procession marched the University Marshal and Bellman, and then followed the boys of the High School, the boys of the Central School, members of the Temperance deputations, the servants of the College, the Mayor and Corporation, the Undergraduates and Fellows of Balliol, the Vice-Chancellor and proctors, and other members of the University and private friends. The coffin was borne on the new open car belonging to Mr. Stroud, New Inn Hall-street, and was followed by five mourning coaches. In the first were Mrs. Green and Mr. Kay (brother-in-law of the deceased); second, Miss Green and Miss B. Green (sisters), and the Rev. J. H. B. Green (uncle); third, Miss M. Green, Miss K. Green (half-sisters), and Mr. Arthur Green (half-brother); fourth Mr. C. Vaughan (cousin), Mr. H. P. Symonds (cousin), and Mr. J. St. Loe Strachey (nephew); fifth, Mr. H. Strachey (nephew), Rev. C. H. Simpkinson (nephew), Mr. Taunton, Professor Nettleship, and Rev. E. L. Fellowes. There were also several private carriages. The route taken was by Magdalen-street, Beaumont-street, and Walton-street, and throughout large numbers of people had congregated, and at the Cemetery gates the police had the greatest difficulty in keeping the crowd outside until the cortège arrived. The Master of Balliol having read the remainder of the service, the coffin was lowered into a new brick vault, eleven feet in depth, the wreaths of flowers then being so numerous that they could scarcely be laid on the lid. Among those whom we observed in the Chapel or at the grave were — The Vice-Chancellor (the Master of Pembroke), the Archdeacon of Oxford (Dr. Palmer), the Warden of Keble, the Warden of Merton, the Principal of Jesus, the Warden of Radley College (Rev. R. J. Wilson), Dr. Acland, Sir William Herschell, Prof. Goodwin (London University), Prof. Stubbs, Prof. Bryce, M.P., Prof. Bradley (Liverpool University), Prof. Robertson, Prof. Bartholomew Price, Prof. Prestwich, Prof. Caird (Principal of Glasgow University), the Vice-Principal of St. Edmund Hall (Rev. G. F. Lovell), the Vice-Principal of Cuddesdon College (Rev. — Gore), Pandit Shyamaji Krishnavarma, the Revds. Canon Bright, R. B. Girdlestone, H. O. Daniel, J. Rigaud, H. A. Pickard, W. B. Duggan, E. A. Knox, G. W. Kitchin, J. R. King (Chairman of the School Board), C. E. Hammond, R. W. M. Pope, W. F. Short (New College), W. L. Newman, Dr. Griffiths (late Warden of Wadham), A. Watson (Fellow of Brasenose), F. J. Chavasse, E. C. Dermer, W. A. Spooner, C. J. H. Fletcher, — Hall, H. A Harvey, H. Price-Hughes, W. Hackney, and C. Higgins; the Mayor (Mr. J. Jenkins), the Sheriff (Mr. A. Wheeler), Ald. Cavell, Carr, Spiers, Sanders, and Eagleston; Councillors Banting, G. Castle, Emberlin, C. A. Galpin, Twining, Anderson, Freeman, Downing, Cooper, Gray, Patterson, Darbishire, Gardener, Simmonds, Ansell, T. H. Ward, and Houghton; Dr. Child, Dr. Tuckwell, Mr. W. Wootten-Wootten, Mr. E. L. Hussey, Mr. J. J. Bickerton (Town Clerk), Mr. J. C. Wilson, Mr. W. Ward, Mr. Omond, Mr. F. P. Morrell, Mr. G. Ward, Mr. S. Davidson (who returned from Egypt immediately on the receipt of a telegram announcing the death of Prof. Green); Mr. R. G. Tatton, Mr. A. Robinson, Mr. Shadwell, Mr. Monro (Oriel College), Mr. Pollard (Master of the New High School for Boys), Mr. Paravicini, Mr. Toynbee, Mr. T. W. Mallam, Miss Smith, Mr. Burstal, Mr. Buckell, Mr. Cross, Mr. H. Underhill, Mr. J. Richardson, Mr. E. Beaumont, Mr. G. Brunner, Mr. G. D. D. Dudley, Mr. J. A. Partridge, Mr. Goold, Mr. Isaac Alden, &c. The various Temperance organizations were represented as follows:— Church of England Temperance Society by Mr. John Abbey, Diocesan Secretary, and others; United Kingdom Alliance, Mr. Councillor Grubb and Mr. J. M. Skinner, District Superintendent; Oxfordshire Band of Hope and Temperance Union, Revds. W. Hackney, C. Higgins, and T. Pinnock, Messrs. J. M. Albright (Charlbury), J. Banbury (Woodstock), E. Beaumont, R. P. Hookham, M. A. A. Mathews, Melvin, J. Thornton, B. Busby, G. Kempson, &c. Deputations were also present from the “City of Oxford” and “St. Clement’s” Lodges of I.O.G.T., and the Sons of Temperance. The whole of the funeral arrangements were carried out by Messrs. Elliston, Cavell, and Son, Magdalen-street. The attendance at the funeral was the largest gathering of members of the University and citizens combined we ever remember to have seen on a similar occasion in Oxford, and more would no doubt have been present had it been full Term. Nearly all the shops on the line of route which the procession took were partially closed, as well as many others in other parts of the City, and the blinds of many private houses were drawn. The bells of most of the Churches were tolled, and other marks of respect were paid to the memory of the deceased gentleman. A Band of Hope entertainment, which was announced to be given in the Town Hall, and a meeting of the West Ward Liberal Association, both of which were fixed for Wednesday evening, were postponed on account of the death of Professor Green. His wealth at death was £15,205 1s. 2d. At the time of the 1901 census Thomas Hill Green’s widow Charlotte Byron Green was living alone with two servants at 27 Banbury Road, and in 1911 at 56 Woodstock Road. Originally an opponent of women's suffrage, she later became a supporter. More information on her involvement can be found in Katherine Bradley's doctoral thesis “Faith, perseverance and patience: the history of the Oxford suffrage and anti-suffrage movements, 1870–1930”. 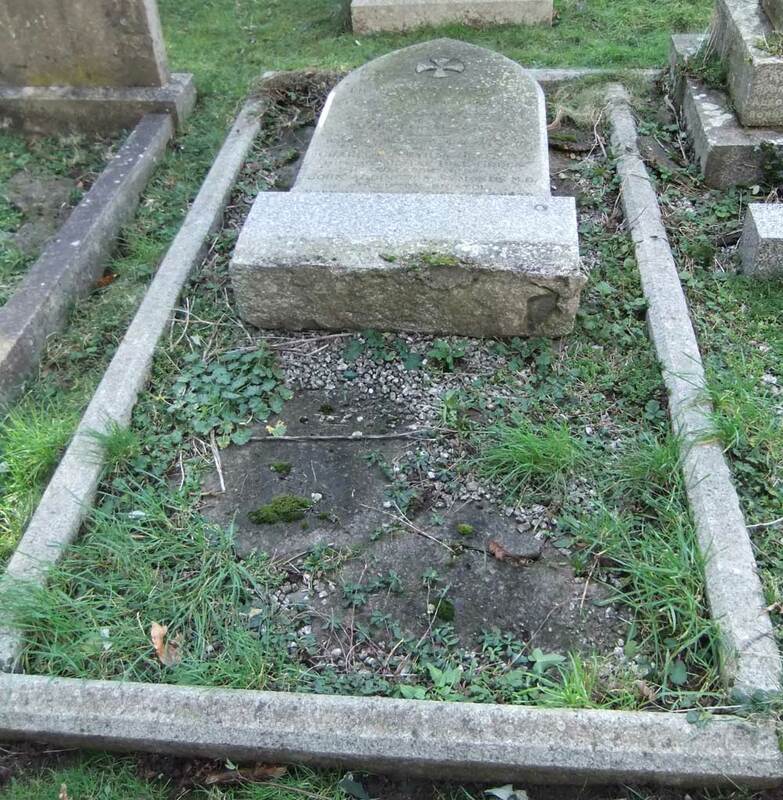 † Mrs Charlotte Byron Green née Symonds died on 4 September 1929 at the age of 87 and was buried in her husband’s grave in St Sepulchre’s Cemetery on 7 September (burial recorded in the parish register of St Michael’s Church).